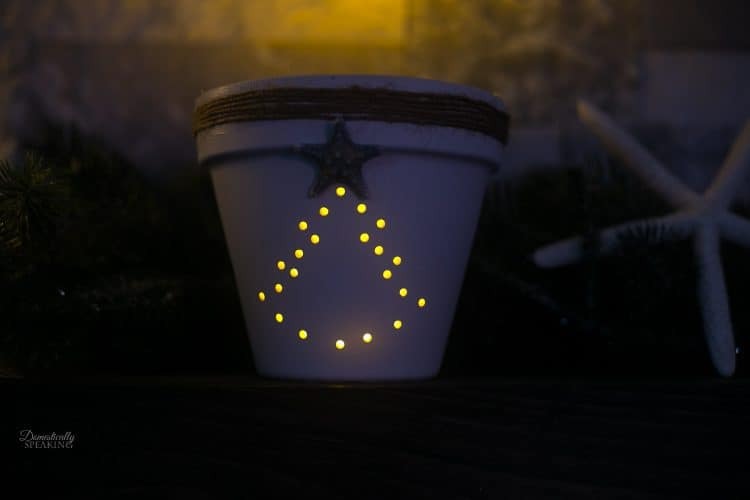 This DIY Coastal Terra Cotta Christmas Lantern is perfect for any beach lover! You can also change up the look and make it the perfect gift for anyone. 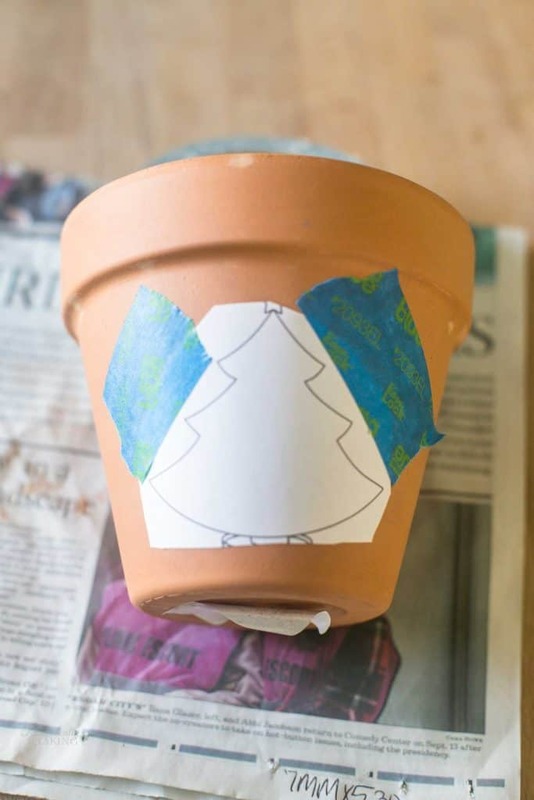 This is a fun project that is a great beginner DIY project! 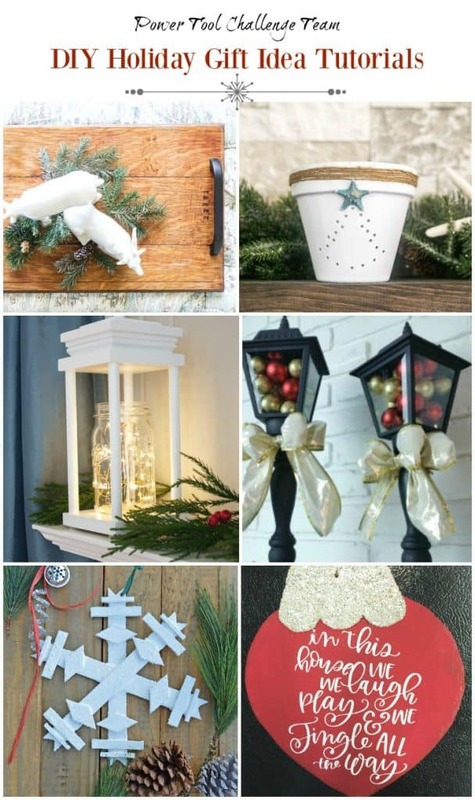 And I absolutely love how customizable this Christmas lantern is. I went with a Christmas tree shape, but you could use any simple shape. Change the paint colors and the added details and you’ve got a completely different look. I printed out a simple Christmas tree design. I marked the spots that I wanted to drill the holes. 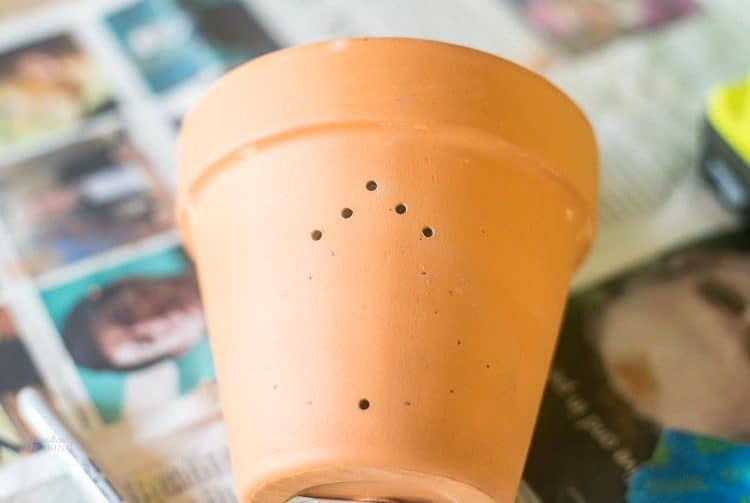 With a pencil or sharpie pen press firmly until you can see the dot on the pot. I started on a low speed, pressing firmly until the drill bit went through. It took about 10-15 seconds per hole. 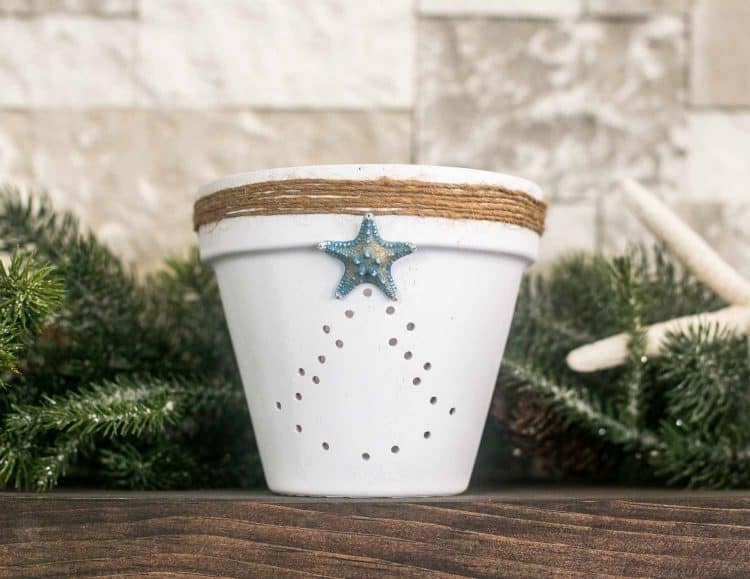 Within a few minutes you have a cute Christmas tree design! After wiping off the drilling dust I gave the pot a few light coats of white spray paint. 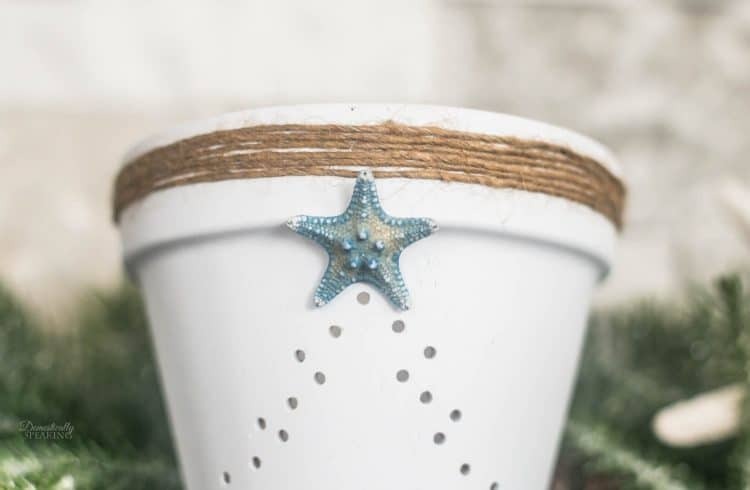 Once the spray paint was dry it was time for the fun additions, a little blue starfish and some twine. It’s the cute additions that make this lantern have that coastal flare! It’s super cute all lit up at night too. I used a little led faux candle inside. Now make sure to check out the other great Christmas Power Tool projects from the team this month! This is so cute! It could probably be customized for every holiday. A great DIY!! YES!!! Absolutely – glad you like it! 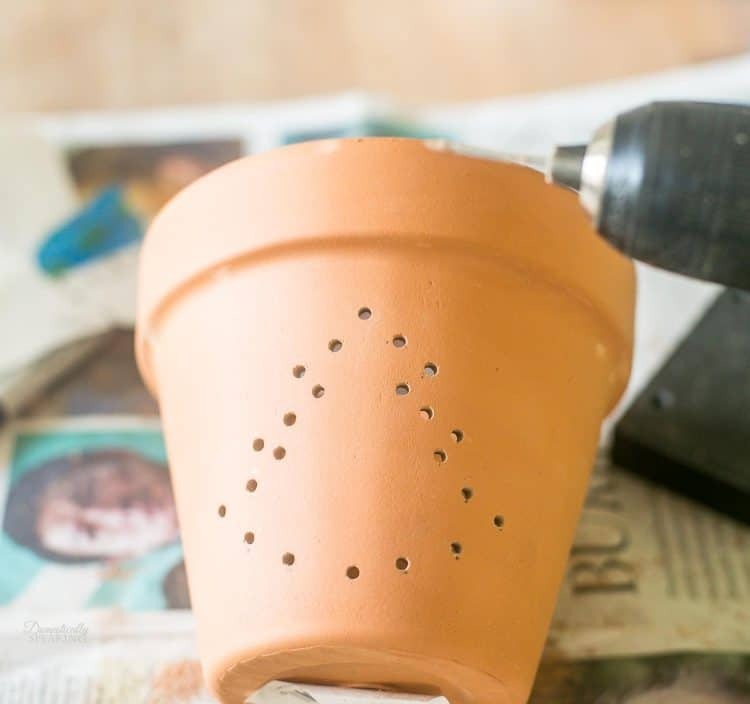 I love the light factor and drilling the holes in the clay pot! How pretty and clever! 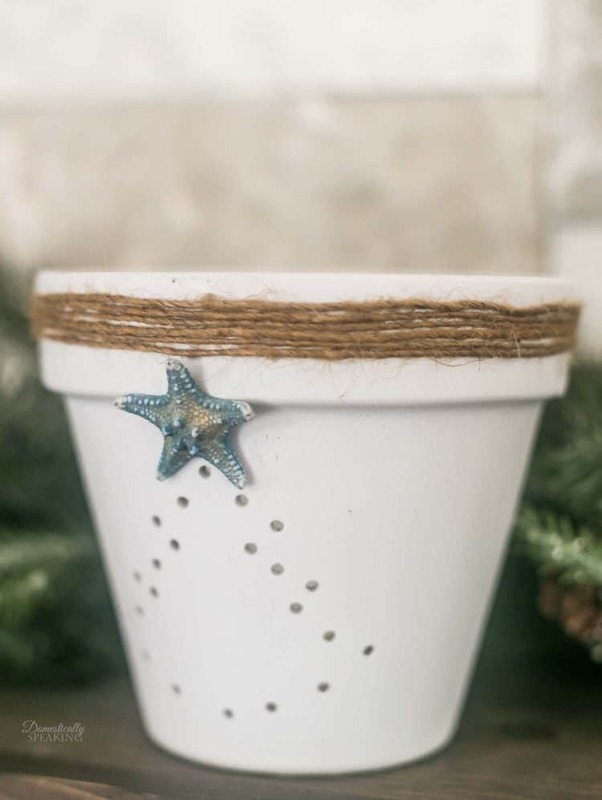 I love this design and the idea of drilling the holes!! Beautiful and pinned! This is so cute! I think I’d want to keep it out year round with an LED candle inside. I’m thinking ahead to Valentine’s Day…Wouldn’t this be cute with a heart? Super cute idea – yes, totally able to customize for different seasons/holiday! 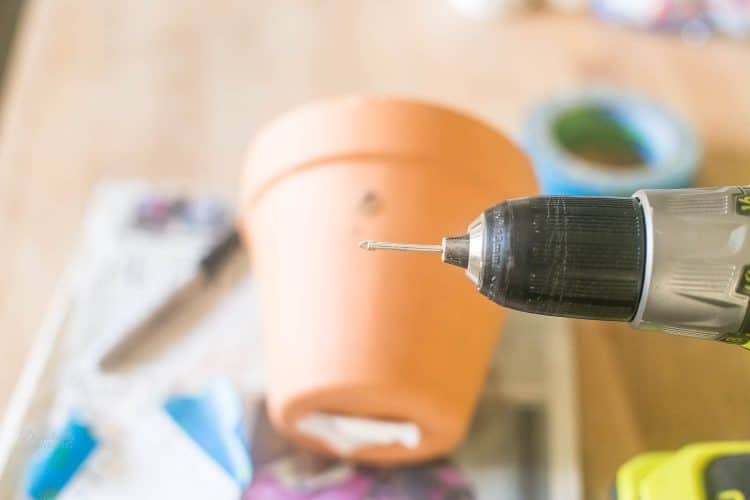 Maryann, I would have never thought to drill into a clay pot! It turned out great!